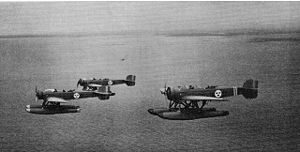 The Heinkel HE 5, produced in Sweden as the Svenska S 5 and nicknamed the "Hansa", was a reconnaissance seaplane built during the 1920s. It was a further development of the HE 1, sharing its same basic configuration as a low-wing, strut-braced monoplane. The HE 5 also built upon Heinkel's experiences of mixed construction as used on the HE 4, having a fuselage structure of fabric-covered steel tube, and wooden wings largely skinned in alloy. The usual crew carried was just two, pilot and observer seated in tandem, open cockpits; however, some HE 5s also had a third cockpit which could be used to carry a trainee. Two prototypes were built in 1926, and after initial testing were entered in the German seaplane trials at Warnemx�nde, winning first and second places in the speed trials. The Swedish Air Force soon ordered the type to supplement the HE 1s, HE 2s, and HE 4 that it had acquired when it took over Swedish naval aviation in 1926, and eventually 40 HE 5s were built under licence by Svenska Aero. In 1927, the Soviet Union also ordered the aircraft, to replace the obsolete flying boats then in service. A prototype was tested on the Black Sea in March the following year, where it was discovered that the aircraft's performance was significantly lower than had been specified by Heinkel. Modifications were made to a second prototype, and this was flight tested in November. This led to an order in quantity soon thereafter, but they did not remain in service long, being phased out by 1930. In Germany, however, the type remained in service until 1933, with machines licence-built by Focke-Wulf equipping clandestine naval aviation units disguised as training schools for airlines. Two HE 5s are preserved in museums - one at the Flygvapenmuseum in Linkx�ping, and one at the Muzeum Lotnictwa Narodowe in Krakow. "The German Seaplane Competition". Flight: 479. 5 August 1926. http://www.flightglobal.com/pdfarchive/view/1926/1926%20-%200549.html. Retrieved 2008-04-23. Heinkel HE 5 Pictures and Heinkel HE 5 for Sale.